Indian banking started on the 18th century, specifically on the last decades of that century. Among the first banks established in India were the General Bank of India (1786) and the Bank of Hindustan (1790). Both of these banks, however, are now non-operational. The State Bank of India (1806) was the oldest bank in the country which still exists until today and is now known for its name Bank of Bengal. The Bank of Bengal is said to be one among the three presidency banks in the country. The other two are the Bank of Madras and Bank of Bombay. Indian banking can actually be categorized broadly into specialized banking institutions, private banks and nationalized or government-owned banks. Reserve Bank of India is also in existence and it serves as a more centralized body which monitors shortcomings and discrepancies in the banking system. During the recent years, the great need of banks to focus their attention more on customers has led them to adopt a faster approach when it comes to providing banking and other financial services. This further led to new financial products and services being unleashed all over the internet that allowed Indian banks and other financial institutions to take a look on their current portfolio offering and make some new developments to compete with the others. This transforms the Indian banking industry into a more dynamic and a highly proactive entity at present. 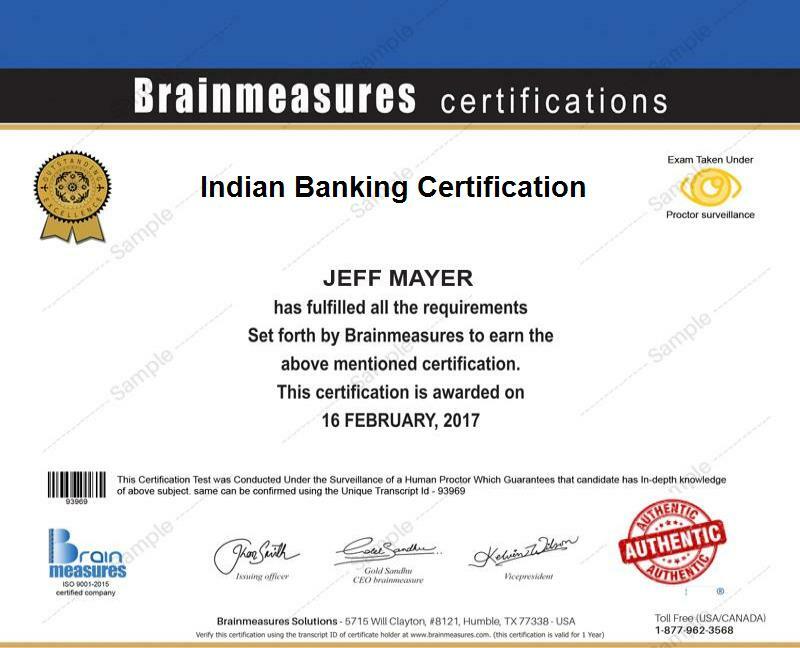 Gaining a more comprehensive background about Indian banking is now possible with the Indian banking certification program offered Brainmeasures. The Indian banking course offered by Brainmeasures is a major help in your attempt to understand the history of banking in India, its evolution and the most recent banking developments in the country. You will also become more familiar about the legal finance and accounting laws and regulations followed in India. The Indian banking training that you can get from Brainmeasures is so comprehensive that you will never find it hard to acquire accurate information about all the major banks in the country as well as the banking policies that they usually follow. A more comprehensive knowledge about Indian banking is what you will get from this online certification course so it is highly recommended for you to take part in the program if you are interested about becoming an expert in this field. The Indian banking certificate that you will receive at the end of the program will be an indication that you have a strong background about the field and you can handle all your responsibilities if you get a position which requires a complete understanding about Indian banking. Brainmeasures Indian banking certification course is extremely useful for individuals who have longed to become a part of any reputable banking institution in India or for those who want to gain a complete understanding about how Indian banks operate. Indian banking certification course is even more beneficial for mid-level banking executives who want to gather information and acquire a certificate which will allow them to move forward and obtain leadership roles in an organization. According to Payscale.com, the pay for Indian banking certification holders is very profitable. The average earnings for Indian banking experts as stated in Payscale.com is around Rs 177,000 to Rs 851,000. Bonuses that usually range from Rs 9,000 to Rs 665,000 are also offered to Indian banking certification holders apart from their regular pay.